Boasting QHD resolution on a 25” screen, Philips 258B6QUEB is the first monitor built by the Japanese electronics giant that features USB type-C connectivity, offering wide compatibility with high-tech devices. USB-C promises to be the last interface users will ever need – one cable can be used for high-speed data transfer, charging devices or connecting external monitors to a smartphone or notebook. Philips 258B6QUEB provides transfer rates up to 10Gbps (or 1,280 MB/s) through USB 3.1 Gen-2 interface and up to 5Gbps by Gen-1 USB 3.0. To put in perspective, USB 3.1 is twenty times faster than a high quality USB 2.0; a 4K video can be transferred in less than 60 seconds. Thanks to its thinner connector design, USB 3.1 is suitable both for small sized wearable gadgets as well as notebooks. The cable can be plugged in either way, as it features a reversible mechanism – offering a plus of accessibility. Apart from the USB-C connection, Philips 258B6QUEB comes with HDMI ports, DisplayPort 1.2 and DVI and VGA connections. 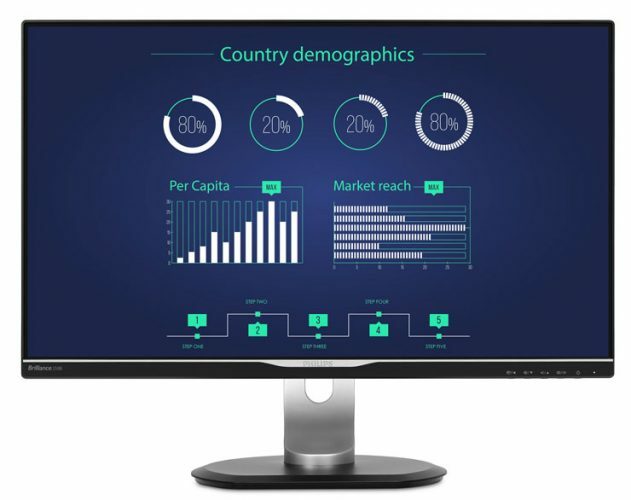 Beyond connectivity options, Philips 258B6QUEB makes use of an IPS screen with a max resolution of 2560×1440 pixels at 60Hz. Viewing angles are more than decent (178° all-around) and brightness measures 350 cd/m2. A 16.7 million colors range is complimented by a 1000:1 native contrast ratio. In terms of audio output, the monitor offers 2x2W stereo speakers with headphone jack. The screen can be rotated by 90 degrees thanks to its ergonomic support, allowing for portrait mode usage. Height can be adjusted in a 130mm range.